I’ve been a member of Sam’s Club for years. I’ve always found it to be one of the best warehouse stores. You can find great deals, and the portion sizes are great no matter what size family you have. They are definitely worth the price of membership. I’ve always been impressed with their produce and meat selection and was happy to participate in their summer “Whole meal on the grill” challenge. I received a $50 gift card to Sam’s in order to buy all the ingredients I would need to make a meal on the grill for my family of four. My husband, my two boys and I set out on a Friday afternoon to make our selections for our weekend feast. We had a hard time choosing what cut of meat to buy – it all looked so good! 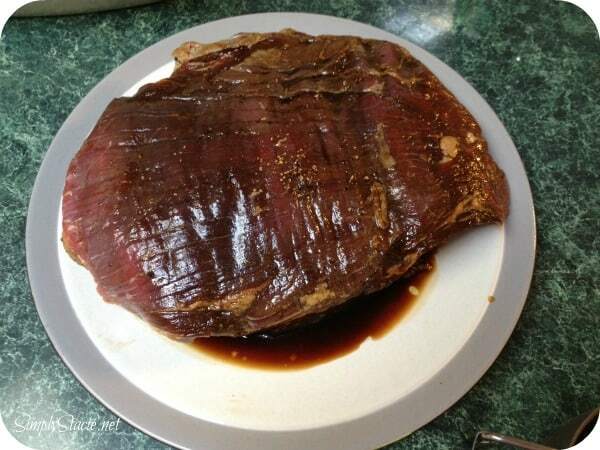 We choose a flank steak, since that’s an easier meat to marinate. We also picked up some cucumbers, tomatoes, onions and bread for my husband’s famous summer salad. A package of sweet corn and some peppers rounded out our menu items. I find that a lot of the fun in cooking comes in the prep work. My husband and I always have a good time making meals together. Grilling and being outside only makes it all that much better! My husband marinated the meat in a soy sauce, tabasco, sea salt homemade marinade. While the meat marinated, we cut up onions – some to sauté and have with our steak, some to use cold and raw in our summer salad. Then we also cut up the cucumbers and tomatoes for the salad. 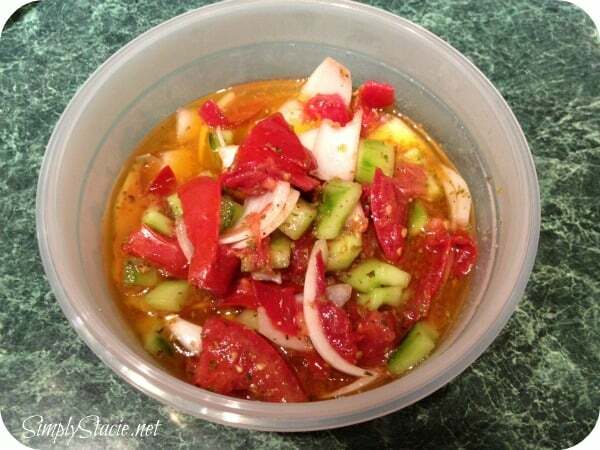 Once the veggies were cut, we mixed them in a bowl with a homemade Italian style dressing. We wrapped the corn in foil for the grill, and we put a little dressing on the peppers to prep them for the grill as well. 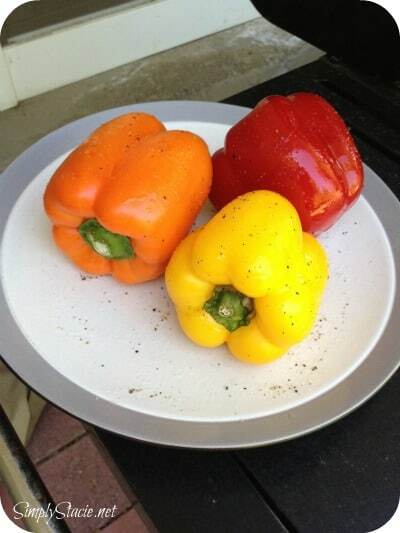 I like my peppers charred on the grill, so I had my husband leave a few on a little extra longer for me! 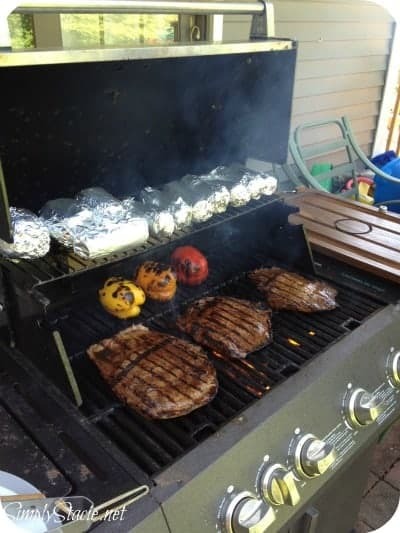 The meat and veggies grilled to perfection. And the cool summer salad (with the French bread to sop up all the dressing!) was a perfect side dish. Everything was fresh and delicious. You can learn more about Sam’s Club on their website. Disclosure: I was not financially compensated for this post. I received a $50 gift card from Sam’s Club to facilitate my review. The opinions are my own, based on my personal experience with the product. skewers with zuchinni, onions, and mushrooms and or steak! 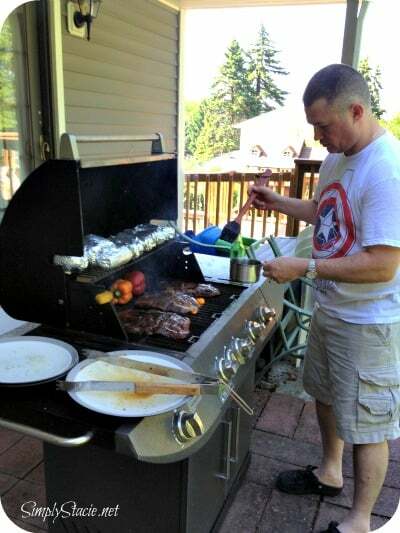 Thanks for the giveaway…we like to grill beef & vegetable kabobs ! My favorite food to make on the grill is ribs.